Just when you thought the hunt for the various Nike Roshe Run styles couldn’t get any more frenzied, this happens. 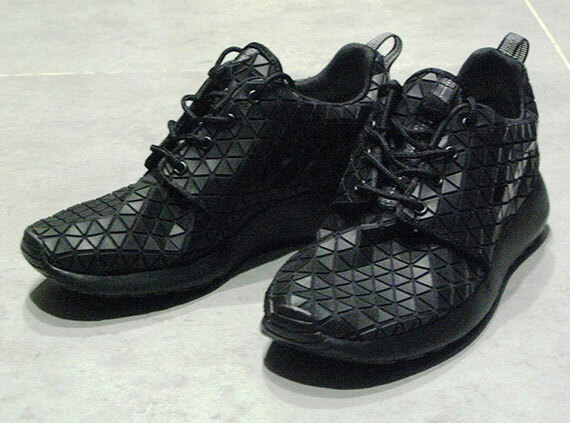 What you’re looking at is another WMNS exclusive version of the coveted Roshe, this one sporting a crazy geometric pattering all over the jet black upper. Can they cause the same stir that the likes of the recent Nike Roshe Run FB has? We’ll see how that turns out, but until then hit the jump for full images and stick with Sneaker News for the word on when the Nike Roshe Run WMNS “Metric” QS hits stateside retailers.